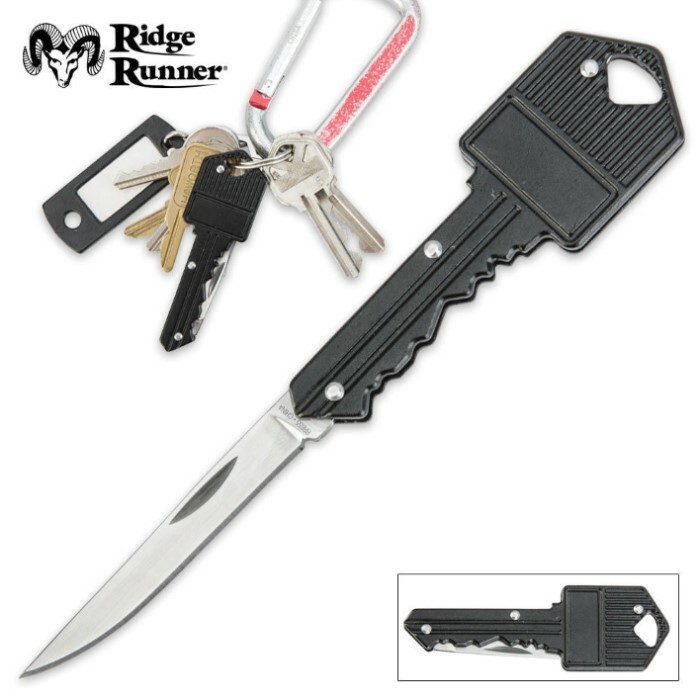 Ridge Runner Key Pocket Knife | BUDK.com - Knives & Swords At The Lowest Prices! 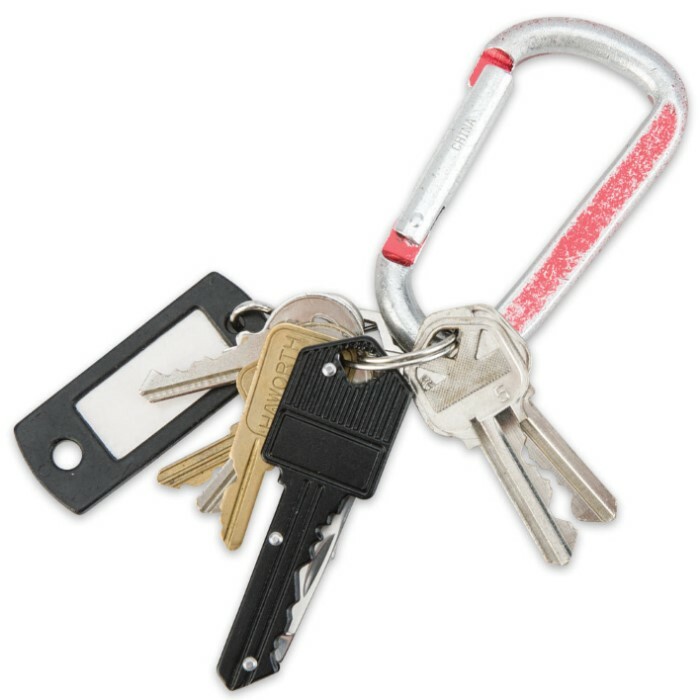 This key folding knife fits right on your key chain and looks just like a real key! Hidden inside is a 2" blade constructed of 420 stainless steel. 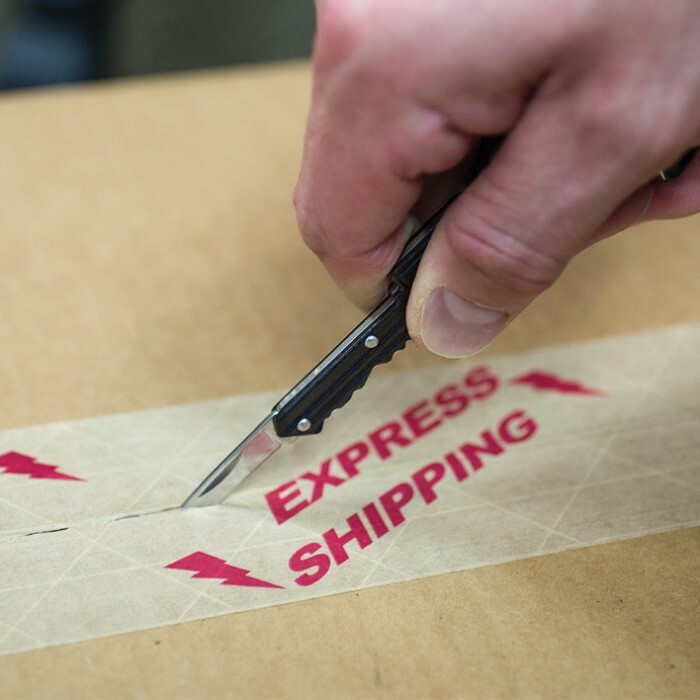 The black anodized aluminum handle gives you a secure grip and also makes this knife look like a real key. This is the second batch of ten I have got. They make the best gifts for those who need a little edge (no pun) for personal protection when nothing else can be carried. The quality is far and above the price. Excellent product with sharp/long knife. Have bought others for less money, but this is larger, longer, sharper, much better quality. I'm impressed. Expected junk, got something with some weight and sturdy build. The blade even has the springy feel of a real pocket knife. No locking, but of course not. As evident in the photos, it's significantly larger than even a large key, so it won't blend with the other keys on your keychain. No doubt the black paint will wear off as it get scratched by the other keys, but only time will tell. This knife is much higher quality than others I've seen. I have been looking for a pocket knife that will not break off of the key ring and be handy for opening boxes, letters, etc. It is crafty for it being key shaped and it is sturdy. I am happy to find this item here. I would suggest anyone to come look here for this item or anything else. Well made and worth the price! I bought thinking it would be a cheap little cool knife for show but it's actually pretty high in quality. It comes pretty sharp & the blade is not loose at all. I would recommend this to anyone. I cannot carry my nife on me when I am working, so this is a good way to have some form of protection that is also concealed because it fits right in with my other keys. Great Christmas gifts for the man or woman that needs a handy "pocket" knife. Would recommend to anyone. For the money it's not bad at all. It's actually bigger than I thought it would be.